So as many of you know, back in November of 2014 I bought a brand new Dodge Charger with the 3.6L flexfuel engine and have been running E85 in it since I bought it. The ONLY time that E10 has been ran in it was the first tank, and that was only due to the fact that the dealership filled the tank with it. Also, on ONE other occasion I was out of the "E85 grid" and filled with 2 gallons of E10 to have enough fuel to make it back to the "grid". So I decided today that out of curiosity I would take a white napkin, use my fingers, and really wipe out both tailpipes of my car very good to see how much carbon soot and build up there has been after 256 hours on the engine and 8,000 miles of driving. I have included a picture of the napkin so you guys can see how little amount of carbon there is on the rag. I am very excited and a firm believer now that yes E85 is so much cleaner than "crapoline", as my good buddy Aaron would say. I thought before that yes sure E85 is a small amount cleaner but that surely it was not even half as clean as gasoline. Better yet, make a video of wiping the tailpipe and then revealing what exists on the cleaning cloth. That is exactly what I used to observe with the Ford Taurus I drove- and I used to point that out to anyone who would listen. I will say however that with the GM FFVs I owned or drove showed far less difference in tailpipe carbon- not sure why except the Taurus poured out a lot more condensation on cold start- possibly further cleaning the exhaust beyond the already low carbon emissions. 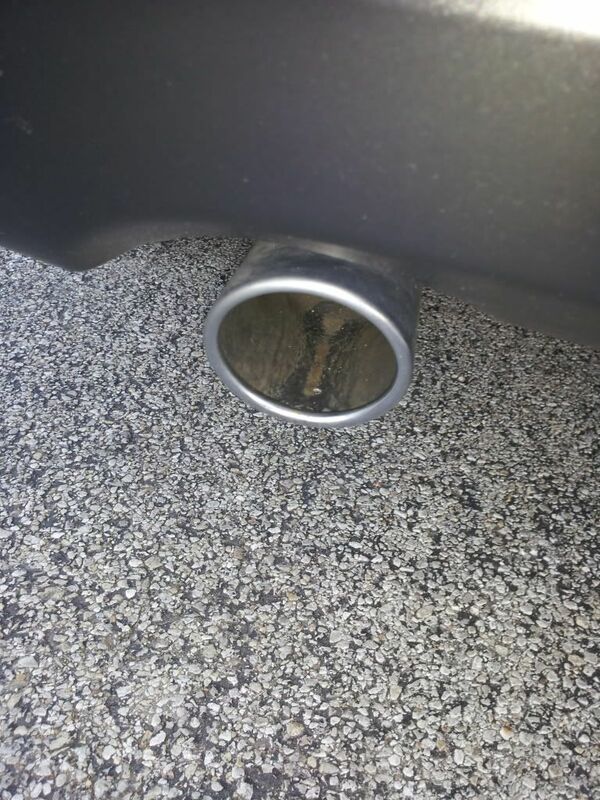 The tailpipe on my Ford Escape is the exact same way, it almost looks brand new. There's no carbon build up at all.